This is a sponsored post written by me on behalf of Castello Cheese. All opinions are 100% my own. So, a couple of weeks ago, I shared my girlish-giddiness with you when I talked gushed on and on about receiving a giant box of Castello Alps Selection Cheeses on my doorstep. Do you remember? Well, if you missed it, I hope you'll drop back by to get a feel for these three amazing varieties of cheese - each stellar in their own rite. Now, if it were up to me, I'd hold (or at least attend) some variety of cheese tasting party weekly. Cheese + Wine? Yes, please. Cheese + Beer. Oh, yes. Cheese + perfect food pairings? You know it! But I will also happily munch on cheese for no other reason than I can't get enough. Fortunately, I still have a fair amount of cheese left over after my cheese tasting and pairing. We've been using it for pretty much anything. The Hirten is being used like Parmesan...on hot, buttered noodles, in pestos, shaved over baked apples. The classic has been sliced for sammies, but also eaten alongside fresh fruit and nuts as the perfect snack. And the Weissbier has gone into bread, used in mac and cheese, and shredded to use in sandwich-after-melty-sandwich! Basically, I'll butter one side of a slice of bread and set it butter side down in a pan over medium-low heat. Add a handful of shredded Weissbier to cover well. Add a few slices of juicy homegrown tomato, sprinkled with a smattering of smoked sea salt and freshly ground pepper. Place another slice of bread, buttered side up on top. 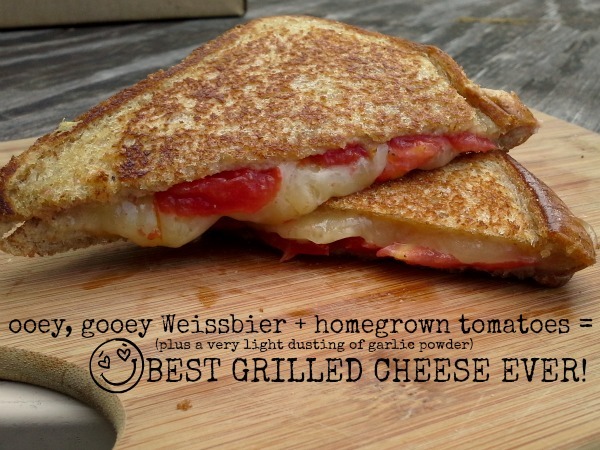 Grill until outside is golden, and cheese is ooey, gooey. Shake a very light dusting of garlic powder on both sides of the sandwich. Enjoy! So many amazing ways to use Castello Alps Selection Cheeses, wouldn't you say!? Which selection would you like to try the most - and what do you think you would use it for? Or maybe you would go the route of the cheese tasting or pairing...if that's the case, why not click on the photo below so that you can have a chance to win a private cheese tasting right in your own home! ?